Drake Bay is a spectacular area of the Osa Peninsula. 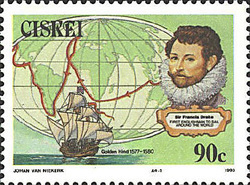 Located at the northern part of the peninsula, the English explorer Sir Francis Drake is credited for "discovering" it, hence the name Drake Bay He used the bay to anchor in 1579 while he was circumnavigating the world. Drake Bay is a very remote and spectacularly beautiful area. It is surrounded by an unspoiled, pristine tropical rainforest that is Costa Rica's Corcovado National Park, an area of natural wonder that compares to any in the world. The Drake Bay area has remained relatively undeveloped, and minimally surfed due mostly to the difficulty in getting there. Over the past few years, however, road improvement throughout the area has made it much more accessible. It has, for the time being, remained pretty much unchanged and does have some great surf. There is an offshore reef that produces great surf as well as many breaks just waiting to br surfed. The rivermouth of Rio Sierpe can give up long lefts or rights and breaks best on a south/southwest swell on an incoming tide. Be on the lookout for crocs. Drake Bay is a place to get away from it all and surf nearby uncrowded quality surf.